When the Obama administration and Democrats in Congress enacted the Credit CARD Act of 2009, the goal was to make credit cards safer and their rules more transparent for everybody. But leave it to banks to find the loopholes. 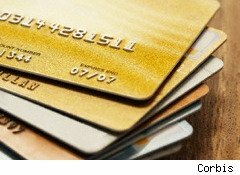 Those new consumer protections weren't extended to cards designated for business or commercial use, and as a result, millions of American households are at risk from business credit cards, warns the Pew Health Group's Safe Credit Cards Project. According to Pew, 40 years ago, business credit cards were excluded from federal consumer protections because policymakers concluded that business owners were in a position to analyze their risks. But banks are casting a very wide net in their search for new "business" customers. Between January 2006 and December 2010, American households received more than 2.6 billion mailed offers for business credit cards, Pew found. And whether the recipient was a large company, the owner of a small company, or just an employee, they're personally liable for all charges -- and again, they aren't protected by the key provisions in the Credit CARD Act. As a result, practices that federal regulators deemed "unfair" or "deceptive," such as hair-trigger interest rate hikes and unpredictable rate increases, remain widespread for business credit cards that are regularly offered to American households. "Every month, more than 10 million business credit card offers are mailed to households at all income levels. The sheer number of offers that are sent to homes all across the nation represents a risk to millions of American families," said Nick Bourke, director of Pew's Safe Credit Cards Project, in a prepared statement. There are all sorts of ways people end up on a mailing list to receive a business credit card solicitation. If you're are a doctor, lawyer, or other professional, issuers may guess that you might have your own business. Sometimes, they rely on demographics: If your neighborhood is home to entrepreneurs, you could get put into that category by association, Bourke explained to DailyFinance. While the total number of individuals who actually hold business credit cards is unclear, there are at least 11 million "small business" credit card accounts, with an average of 1.4 cards per account, according to Pew's research. "To better protect individuals, families and small business owners, we urge that the safeguards found in the Credit CARD Act be extended to any card on which the cardholder is personally liable," says Pew. The report's findings show that banks are pretty much doing whatever they want when it comes to business credit cards. For example, 80% of business card accounts had an "any time change in terms" clause with no right to opt out, which means that the banks can change the account terms with little or no notice. By contrast, under the CARD Act, terms on consumer cards cannot change during the first year; after that, 45 days notice is required, and consumers generally may opt out of the changes. Existing balances are also protected from arbitrary rate increases. Further, 67% of business card contracts stipulated penalty interest rates for late payments or over-limit transactions. Issuers can apply penalty rates immediately and without notice for any violation, and those high rates can last indefinitely on any balance. Under the CARD Act, penalty interest rates may not be applied to existing balances on consumer credit cards, unless an account is seriously delinquent. With business credit cards, penalty fees are virtually unrestricted and may not be reasonable and proportional to the violation. Late fees (median amount $39) can be assessed on 73% of business cards , while 67% were subject to over-limit fees (median amount $39). Again, contrast that to consumers credit cards, where users are protected because penalty fees must be "reasonable and proportional," -- generally $25 for the first and $35 for additional violations within six months. Fees must not exceed the violation, for example, the penalty for a $4 over-limit transaction must be $4 or less. And over-limit fees can't be charged unless the cardholder has opted in and said that the bank may allow such transactions to clear. Then too, issuers can direct payments on business cards first to low-rate balances, such as balance transfers, while interest accrues on higher-rate balances: 84% of business card disclosures gave issuers sole power to maximize finance charges by applying payments to low-rate balances first. For consumer cards, any payment amount above the monthly minimum must be applied to the highest-rate balance first, reducing interest charges to cardholders. While there is plenty of shame to spread around, Pew's research also highlights the "good guys" -- issuers who have voluntarily applied portions of the Credit CARD Act to their business cards. Bank of America (BAC) eliminated penalty interest rates, over-limit fees and late fees and both Bank of America and Capital One (COF) have adopted application of payments to be applied to the larger balance first. "The practices of these banks show that additional consumer protections can be applied to all credit cards marketed to American households and that issuers can still receive fair compensation for the service provided," said Bourke. "Now is the time for policymakers to ensure that the actions of these banks are not the exception, but rather the rule." At a minimum, Pew recommends that the government extend the consumer protections of the Credit CARD Act to any credit card product that requires an individual to be personally or jointly liable for account expenses. Also high on their to-do list: Require issuers to tell applicants whenever a credit card isn't covered by the Credit CARD Act. Moreover, account disclosures should warn of additional risks not found in their consumer credit cards. But for now, the moral is: Go to the mailbox at your own risk. Quite simply, said Bourke, "If you don't own a business, just use a normal consumer credit card. You will get better legal protection."